DobMod: Dob Dolly. Furniture dolly mod to carry 12" Dob. The dolly had been sitting in the wall cabinet for, well, occasional furniture moving during various home projects. Why not the telescope? Because it's too narrow, slippery, and hard to control down there. Thus some easy to remove mods (I don't want to keep two dollies) to address that have been implemented. I just pulled out two suitable 20mm (3/4") plywood pieces from my wood scraps cabinet, cut them so the one is matching the width of my dolly (closer end on the image), and my Dob's base width - another. Screwed them to the dolly as pictured by 4 long wood screws (2 on the image above) (tight to crossbars' edges to max the rigidity). Put the Dob's base three legs on the planks, the front one is centered, and all as far from the plywood planks edges as possible and overly symmetrical. Have all tree legs traced around with the pencil and found their centers, where to drive in massive wood screws with the head's diameter matching openings in the Dob base's feet, which is about 10mm for tight-fit on mine (3 on the image above). These are crucial to prevent the base from sliding during the ride and scope use, or when you want to apply the force to the OTA/base directly while handling it on tight spots or foot guiding (see Benefits 4). The most sophisticated (and actually unique to my build) piece is the No.1 on the image above. These are still very trivial L-shapes screwed down at a certain distance to accept the rear bottom round pipe of the rear leg of my folding two step ladder (image below). It serves as the rigid folding and quickly detachable handle to push/pull/rotate the dolly on the path of varying width I need to traverse (i.e. a half opening door). 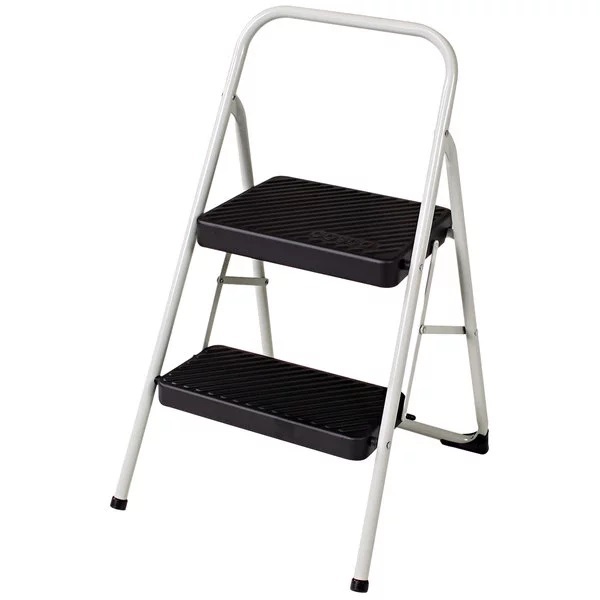 The distance is selected to allow the ladder fold up and rest freely on the mounted OTA side, so I don't have to worry about it falling down on its own (e.g. when I'm riding in the elevator). The single leg is better be mounted above the fixed pair of weels as on the other (turning) end it may compromise the stability of the three-point mount in turns. (I have re-assembled it wrong for the photo session). The L-shapes are drilled on the open end so I can drop in two nails reliably locking the handle in the improvised hinge and easy to remove when you are ready to detach the ladder and use it as a seat, step, table, EP bag hanger. If you have no ladder (or don't want it) it is Ok to simply pull it on a long rope sling (was my pilot model prior to the ladder light-bulb). If your Dob's base legs have no holes, you can add dimples in the plywood to accept them for security (most do as that's the cheapest way to attach them to the PB of the base with recessed screws). Sure thing, all holes were predrilled to avoid materials cracking from massive screws. The Dolly also drilled halfway from the top to accept tips of the locking nails to max the security of the ladder-handle. A smaller dolly may seem more maneuverable, but also less stable especially as I need to lift one end sometimes over 1-2" obstacles (i.e. sliding doors' rims). If adding the rigid handle like mine make sure the L-shapes are high enough to allow the required rotational freedom. I can move the scope out all the way to the observing location fully assembled with all accessories and even with the seat (plus the small EP's shoulder bag) in one run. I can push, pull, rotate, and elevate the front of the dolly using the rigid wide handle extremely efficiently and precisely. The EP is much higher with the dolly, so it's easier to reach various angles standing (as well as go lower above hand-rails on some of the observing locations which I'm using in the building). Might be a drawback for shorter folks though. When observing in the meridian, I can smoothly guide the OTA just bending my leg in the knee little by little, while touching the side of the dolly with the ankle, so it slowly rolls away. 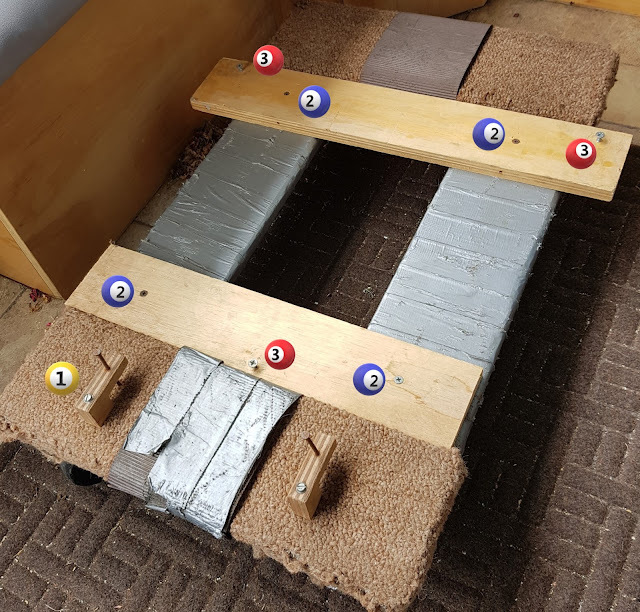 It's easy to disassemble when you need just a regular dolly cart to move the furniture again and re-assemble back in several minutes using just an electric screwdriver. Remove or replace the torn upholstery on it as it's becoming the source of dust over a decade of hard use. Think about even better guiding system (a wheel ramp is probably an overkill, but a simple removable wheel guide box preventing them from rotating perpendicular to the celestial equator - may be of help).